“No photos. No photos.” She waved her hand dismissively at Matt, shooing away his Canon. Up and down the cobblestone street stalls overflowed with colorful Guatemalan bargains. But here was something new: a lady and her loom, actually making one. Having more time than quetzales just then, Matt broke out his basic Spanish. Her name was Manuela. It wasn’t that she was camera-shy, she just understood the value of the unique scene she made amidst a repetitive market. In an economy that earned her something like $8 for a 15-hour table runner, sitting fees traveled the other direction. He watched her weave bright threads and pack them down firmly with a smooth stick, each motion quick and sure from long practice. “¿Cuantos?” he asked her, smiling, “How much?” In amiable fashion, the bargaining commenced. She pointed to her Pepsi bottle, “10. I need to buy food and drink for my family.” He pointed to his pocket, “I only have 8. I would like to show your picture to my wife. 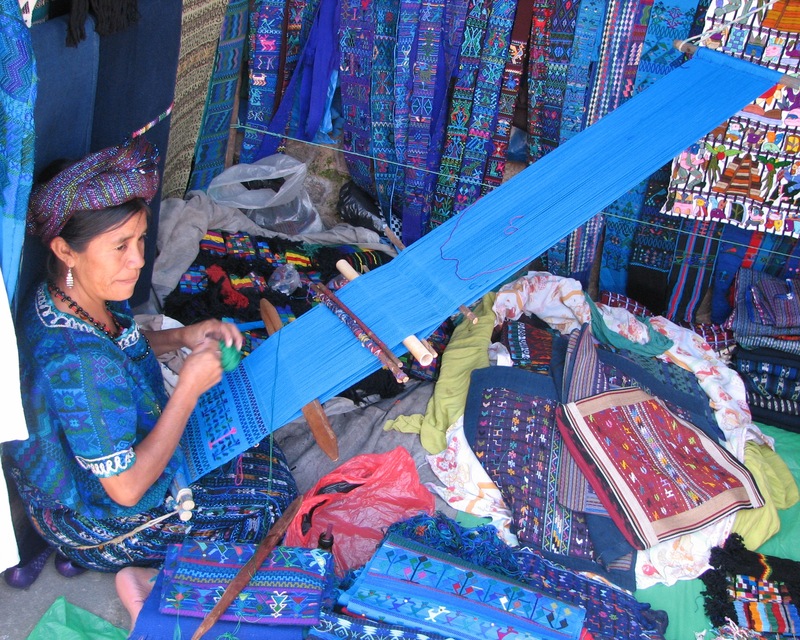 She loves the color blue.” They chatted more about the topics within reach of his language skills: the number of children they had and how long it took to make her wares. Eventually she consented, softened by his good nature and the evidence that his wallet was being honest about it’s contents. For about a dollar and some courtesy, he gained a beautiful picture and made a memory that will outlast everything else we bought that trip– a connection with another culture, a friend made in the bargain. This entry was posted in 1000 Words and tagged bargaining, blue, Guatemala, language barrier, Manuela, picture, Spanish. Bookmark the permalink. oh kris! i love this picture – the blues are deep – bright – soothing 🙂 loved the story about the bargaining. i remember that in china too – such a game 🙂 this woman is such an artist! thanks for sharing. It’s pretty special to me, too, and I think of her every so often. Matt was so excited to tell me about it, I felt like it was a gift he bought for me. Wonder if she remembers the gringo who bought her picture? Praying blessings on her, too. Such beautiful handwork! How much we have lost in this nation of manufacturing. It has gained us further wealth in monetary terms, but has led us so far away from the wonder of what our hands, hearts, and minds can do to beautify the world. These pictures are a treasure of memories, but also a reminder of what we can accomplish. What can I make beautiful today? Knowing you, Chris, a lot. 🙂 Matt especially wanted to show me the simplicity of her loom, how she was strapped into it, and used simple wooden pieces, some of them rough sticks, to make masterpieces.